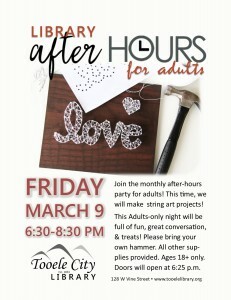 Come join the monthly after-hours party for adults! Learn how to make a gorgeous string art piece. This activity will be full of great conversation and treats! Please bring your own hammer – other supplies will be provided. Space is limited. Doors open at 6:25pm. 18+ only.